A working-class Italian-American bouncer (Viggo Mortensen) becomes the driver of an African-American classical pianist (Mahershala Ali) as he embarks on a musical tour of the American South in the '60s. It's telling that much of the news coverage surrounding 'Green Book' has been more about comments and criticisms surrounding the movie itself than the actual substance of it. If you leave all that aside and take the movie on its own merits, what you're left with is a relatively formulaic tale of friendship growing out of unique differences, with some stable if stilted performances from both Mortensen and Ali. Viggo Mortensen, looking as far away from his role in 'Lord of the Rings' or even 'Eastern Promises', brings a natural humour to the role that helps float the movie and keep it pushing on. No doubt Mortensen probably signed on for the role because of this humour, something he's not readily associated with but utilises here with ease. Mahershala Ali, meanwhile, plays the straight-laced pianist with aplomb and knows how to hold a scene in his hand with the slightest amount of movement or visible effort required. Really, this is where the movie's greatest strength lies - in the dynamic between Mortensen and Ali. Peter Farrelly, best known for broad comedies like 'Dumb And Dumber' and 'There's Something About Mary', has an understanding of how to keep a story on rails and moving forward, but there's something almost too brittle about how it's all handled. The beats of the story are there, just as you'd expect, and there's nothing in it that's anything you haven't seen a hundred times before. 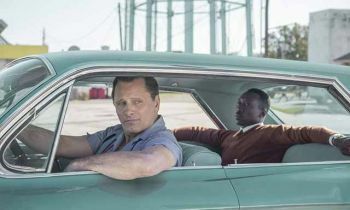 You can take 'Green Book' at face value, and while the ending feels like it's been earned to some degree, there's no denying that any kind of examination of the movie and its story can bring up the fact that it not only glosses over the realities of life in the American South, but effectively smooths it out to the point of it barely registering in a meaningful way. Still, 'Green Book' skillfully glides through on its strong performances and its focused storyline, and makes for an interesting watch - even if you can't shake the feeling like you've seen it before.